The affiliate marketing industry has been booming for quite some years now and it really is one of the best ones to get into if you want to make a huge profit with less work. If you do it right you could reach that 6-figure dream in no time, but do you know which are the best affiliate programmes when it comes to the casino world? When a website owner has a link that leads to an online casino on their website they can benefit financially from it if a user signs up and makes a deposit at that online casino. There are different ways to do so: CPA, CPL or Rev Share. CPA is cost per acquisition and you will get paid a set amount every time a player came from your website to the casino and made a deposit. CPL or cost per lead means that the link owner gets a fee if the user registers at the casino without necessarily making a deposit, but the sum will be lower. Revenue share means that the affiliate will get paid depending on the performance of the player that signs up via their link. While you are relying on the player to keep playing and losing, you can expect to earn as long as that player will continue to gamble at that online casino. Revenue share pays out a percentage of the player’s losses and continues to pay out indefinitely, which is why experienced affiliates tend to prefer this option to the other two. One thing that people are sceptical about when it comes to a rev share option is the negative carryover. Affiliate programs pay on a monthly basis so at the end of the month after payment your balance resets to €0. But sometimes your account might be a negative sum because someone landed a huge win. So, with negative carryover if you are at -€500 when the month ends at the beginning of the next month you will have that -€500, if there is no negative carryover then you will have €0. The thing is that sometimes things that seem too good to be true are too good to be true and some casinos that have affiliate programs that promise no negative carryover might do more damage than good. So, you shouldn’t look reject casinos just because they have the no negative carryover and you should instead check them out thoroughly and see which one is the best option for your particular needs. Jetbull Affiliates is a great program offered by the beloved Jetbull online casino. Jetbull has a dedicated team that has the sole purpose of keeping in touch with affiliates and streamlining the process in order to make everything as easy and fast as possible for everyone involved. They offer a lifetime commission of up to 50% rev share that’s perfect for affiliates looking for long-term cooperation. You can choose sports, casino, live casino or any combination and they help you out with plenty of payment methods and even promotional materials. They also have a sub-affiliates program so that you can earn a percentage of the Net Revenues generated by your referred players, a bonus booster for each tier as well as an additional 10% rev share for up to 20 active depositing players/month. They have a low minimum payment threshold and no admin fees. They do have negative carryover, but it only means that they are fair and keep things in the open. PlayFrank Affiliates is directly related to PlayFrank Casino and just as the casino itself is quite open about what’s going on and the team strives to give you all the information you’d possibly need. From real-time statistics, marketing tools, sib-affiliation and lifetime commissions, PlayFrank, just as Jetbull, offers some great things including up to 50% revenue share. Here you will also find no negative carryover. There are no other options except revenue share, but that’s really all you need. 7Stars Partners is truly one of the best affiliate programs. Not only this, but under this umbrella, you can find not one, but eight great online casinos, starting with Malina and ending with CampoBet. There is just one thing that can be considered a minus and that’s the admin fees. Apart from this, you will only find positives: no negative carryover, no bundling, no payment threshold, no withdrawal limits, sub-affiliation as well as several payment methods and currencies. BOA Partners is the official casino affiliate program of Bet On Aces casino, a new online casino with tons of potential that managed in a few months to become a lot better than casinos with decades of experience. They have a special offer for new affiliates and the first three months of membership you get an increased percentage share. After the duration of the fixed rate is over, you get the standard plan every month. They offer sub-affiliation and a low minimum payment threshold, but on the downside, you will find some admin fees and a withdrawal limit. Bet365 is a famous online casino and so is their affiliate program. While, arguably, the casino’s better than the affiliate program, you will find that here too you have some major advantages. There’s a minimum payout threshold that’s low, there are no admin fee deducted commissions, as well as a wide range of supported currencies. On the slightly negative side we have negative carryover, no other options except for the revenue share and no sub-affiliation scheme. The famous 888 casino has an official affiliate program called Uffiliates that also includes Reef Club Casino and Casino on Net. Uffiliates has been on the market for more than 10 years and it continues to make tops because they are fair. Here you can choose between rev share and CPA, there are incentive commission tiers, sub-affiliation and a low minimum payment threshold. Payments might take a little bit longer than expected and there is negative carryover in place, but there’s no real inconvenience. Casumo casino raised to the top in recent years and so did their affiliate program. They offer you lifetime revenue with no negative carryover and no bundling. The only downside is that they have no sub-affiliate plan and they aren’t marketable in the USA. At this moment in time no one seems to have ever had any complaints for this affiliate program, which says a lot about how they handle their business. This affiliate program has been around since 2016, but since then it’s made an epic reputation for itself. As you will see if you take a look at their affiliate program page they have tons of positive reviews and testimonials from affiliates that they helped reach success. They work with Revenue Share, CPA and Hybrid Deals, have an incredibly low minimum payment threshold and a lot of currencies in which they can pay commissions. While they have negative carryover in place and no sub-affiliation program, they make up for it in the multitude of licenses. This affiliate program is tied to Cashmio casino. Here you can get no negative carryover, no bundling, fast payments even for the low minimum payment with many choices of methods. There are no sub-affiliation deals available and they only pay in Euros, but other than this it’s only smooth sailing beyond this point. Tied to the VideoSlots casino, this affiliate program comes with lifetime commissions, rev share as well as CPA and CPL options, no negative carryover, no bundling, fast payments and no admin fees. On the downside, the commissions are only paid in Euros and by Skrill, but if this is your method of choice then everything’s great. What are some good reasons for choosing revenue share over CPA? 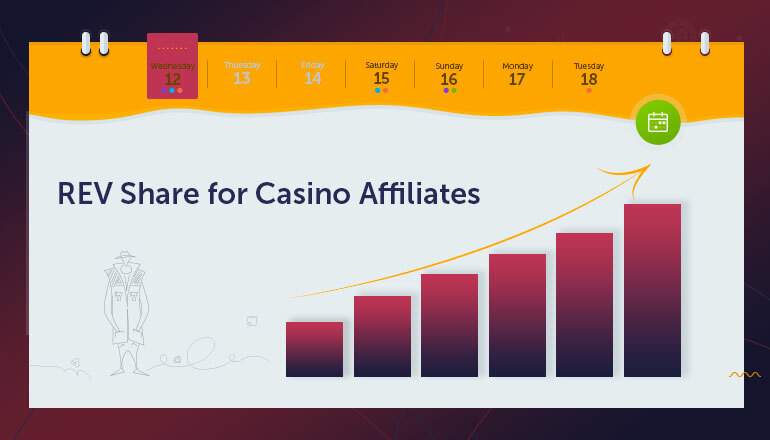 All those that have been combining the online casino industry with the affiliate industry and have been working for a long time know that revenue share will always beat CPA, CPL etc. While CPA is huge right now in many other industries, nothing seems to take down revenue share in the casino affiliates’ mind. The main reason why rev share is better than CPA is this industry is because most players will return and keep playing several times. If on CPA you only get money from their action one time, when using rev share you could be making money on a high roller for a very long time. Most casino affiliates are in it for the long haul, not just to make some money and then stop. For long-term goals, rev share will always be better because at some point the work does itself and you just keep getting a “steady” income for as long as the players keep playing and the casino keeps working. Imagine you bring in a player to a casino. If you bring that player and he makes an account and you get paid with CPA, then that’s it. But imagine that player turns out to be a high roller and makes a 50K deposit in a month. Now, if you would’ve been using revenue share with Jetbull for example, you could’ve potentially gotten half of that sum. Half of 50K. just for you. From just one player. It would be a shame to not make that money if you had the chance, right? Do you want to be a casino affiliate? Check out all these amazing casinos and programs and choose the best ones!